A Royal Navy ship that rescued 730 British military personnel and tourists stranded due to the volcanic ash cloud has arrived back in Portsmouth. 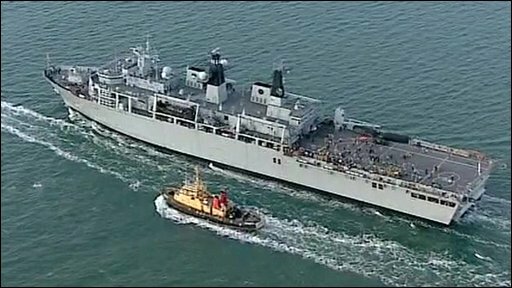 HMS Albion returned after picking up 450 service staff and 280 civilians from Santander in Spain. 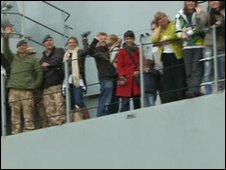 The Devonport-based ship brought home soldiers, RAF personnel, medics and support staff who were deployed in Afghanistan for six months. The ship left Spain at 1230 BST Tuesday and docked in Portsmouth at 1900 BST. Abdullah Ali, 14, who travelled home on the ship, said he bonded with soldiers on board by playing video games, and slept for 20 hours on the 36-hour voyage. The military personnel included members of RAF 9 Squadron from their base at Marham, near King's Lynn, medics from 33 Field Hospital based in Gosport, Hampshire, the Royal Anglian Regiment and battle group support staff. They were stranded in mainland Europe when a volcanic ash cloud from an erupting volcano in Iceland grounded flights for several days. Prime Minister Gordon Brown ordered the 18,500-tonne warship to help bring the armed forces personnel home. They first had to fly to Cyprus, before flying on to Spain to be picked up by the ship. Stanley Johnson, the father of London Mayor Boris Johnson, and his wife were among the civilians on board after being held up returning from a trip to the Galapagos Islands. Mr Johnson told the BBC it had been an "extraordinary couple of days" and a "humbling experience because of the politeness, consideration and professionalism with which we have been treated by the navy personnel". A group of teenage boys on a football tour were also brought home. The civilians were considered to be among the most vulnerable stranded British citizens in Spain and had to share Navy rations during the trip, including fish and chips. On arrival in Portsmouth, they were met by city council staff along with The Salvation Army and St John Ambulance volunteers to help them with the final stages of their journeys. "They will be tired and probably unsure of how to get to their ultimate destinations, so we will be there if they need help," Cindy Jones, civil contingencies manager, said. Portsmouth ferry port manager Phil Gadd said: "We have experienced a huge growth in people using the port over the last week due to the travel chaos caused by the ash cloud. "Yesterday our figures showed that we have had 21,000 additional foot passengers compared to the same period last week." HMS Albion, which acts as a command platform for the Royal Navy's amphibious task force and landing force, is capable of carrying more than 600 personnel as well as vehicles and combat supplies. How do stranded people get home?